Please, can I have some more? 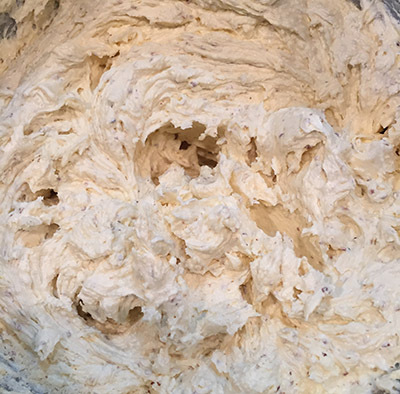 White and fluffy butter and sugar mix. Following recipes is often a work in progress. I’ve seen recipes that have wrong amounts of ingredients, are missing key items, have cooking processes in the wrong order, that seem to be missing something important. Sometimes it’s obvious, but sometimes it’s only part way through you notice. Occasionally it’s only the misshapen thing at the end that makes you wonder: Was it me or the recipe? (Sometimes it is me, of course. I’m notorious for not following recipes exactly). But there are some recipes in some fancy cookbooks by notable chefs that I’m pretty sure no one even bothered to read over. The assumption seems to be that those big, glossy coffee table books are just for looking at, not for actually cooking from. Often the safest are the non-fancy cookbooks, put together by people for whom it was a labour of love. Someone passing on their grandmother’s recipes, or their own from a lifetime of devotion to their craft. Having said all that, today’s recipe is in neither of those camps. It’s not fancy, and it’s not personal. It comes from an interesting but fairly anonymous book called Bake by Alison Thompson. 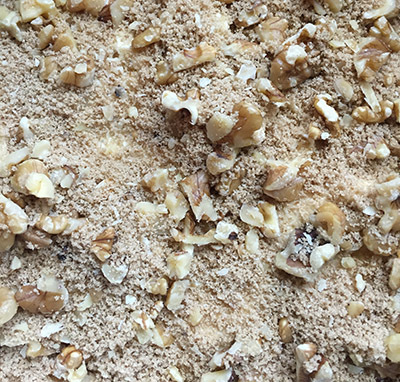 The walnut and soft brown sugar sprinkle. It also produces a delicious cake that disappears faster than any cake I’ve ever made. But … something’s wrong. So this is going to be one of those recipes I experiment with while I work out how to fix it, without destroying what makes it so fantastic. Before I go into the recipe, I’ll be clear on the problem. This cake has an enormous amount of butter, particularly in relation to the other ingredients. And it leaks a surprising amount of it from the springform tin during the cooking process. The first time I made it, there was a pool of butter at the bottom of the oven which created a smoke disaster. This time, I made sure I all the proportions were exactly as in the recipe, and put a tray under the cake while it was cooking, just in case. And yes, once again a huge pool of melted butter. Apples placed nicely on top of the cake. probably discover it’s something I’m doing wrong. As I’ve said before, I’m no baking expert. So if anyone knows what the issue is, please tell me. 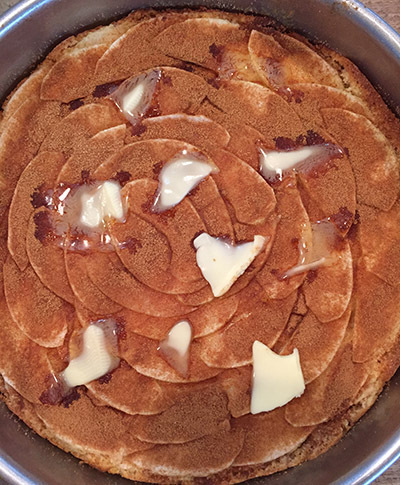 Half way through he bake, sprinkle the top with sugar and cinnamon, and put some dots of butter on. 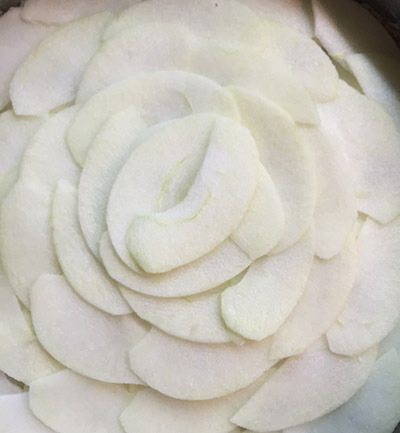 2 Granny Smith apples, peeled, cored and finely sliced. (These were fresh off a friend’s tree and perfect). I did a double layer. Cook for 30 mins, then sprinkle a mix of sugar and cinnamon over the top. How much you use is up to you. There’s not a lot of sugar in this, so if you want it sweeter, add more sugar. I used about two tablespoons of sugar/cinnamon mix and the result suited my taste for a cake that’s not too sweet. Cook for a further 20-30 minutes. My oven tends slightly slow so I cooked it for the full 30. The recipe says to cool in the tin, but I had guests and it only had 5 minutes.